Three 0 gauge versions in toy/model form of a `Schools` class locomotive of the Southern Railway of England. Top – A modern production made by Ace Trains. This a scale model but able to run on coarse scale train tracks. Mainly intended for adult collectors/operators. Has electric motor. Middle - The Hornby version made by Meccano Ltd from 1937 until WW2 stopped production. Not to scale in many details and simplified. Can be regarded as a superior toy, but is 74 years earlier than the loco above and cleverly used standardised parts that were also used in other Hornby locomotives. Had the option of clockwork or electric power. Bottom - Made by Mettoy, late 1930s and into the early 1950s. A pure toy of modest cost and intended for youngsters. No pretence at being scale but good enough to make a child happy! Clockwork power only. Made in two versions, one with reversible motor. Marklin (Germany) aeroplane wagon with load. Gauge 1, made about 1908. Also a Fibre Wagon, even older. So these are true antiques, being over 100 years old! Hornby LNWR trainset from 1920, the first year of Hornby production. Note the small wheels of the locomotive, indicating the first type of clockwork motor. When Ferris designed their C36 locomotive it is probable that they had thoughts on including some portions of Walschaertes valve gear operating rods etc. 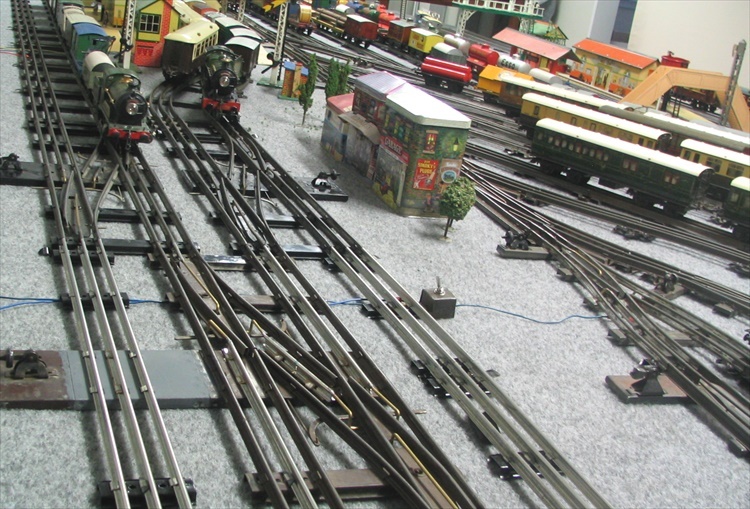 Clues to this are the dummy eccentrics on the coupling rods (even though this would be quite wrong!) and provision on the cylinders for valve rods. I fitted some simple rods to my locomotive to check the effect. No attempt was made to make the other parts of the gear, namely combination levers and Union links etc. It is doubtful that Ferris would have bothered with these anyway . The Ferris has incorrect alignment of the cylinders and driving wheel centres so there is little room for the dummy expansion link but I have squeezed in a short link. What I have done is not of high standard , but adequately gives an idea of how the loco would have looked if Ferris had decided to fulfill what must have been their original intention. These two pictures are of the same wagon! A 1920s Hornby Gas Cylinder wagon. Bob Williams has restored it from a wreck into an item that looks new! Terrific! Two Hornby tank locomotives (20 volt motors) from the 1930s. They are lettered NZR for New Zealand Railways. Type E120 at left, type LST120 at right. The LST120 has the French style motor, predating by a year the introduction of the English 20 volt motors by Hornby. 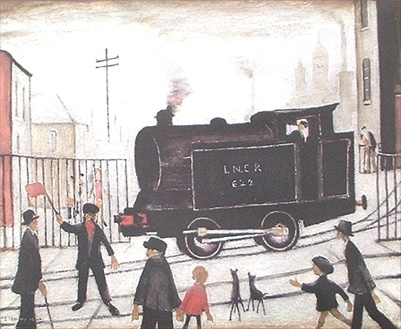 J.S.Lowry was a famous British painter. He painted a picture of a level crossing. The locomotive was a bit odd. Evidently he borrowed a Hornby No.1 tank engine to copy! Crossovers on three rail Hornby and Middleton track.